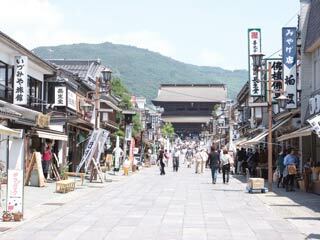 Zenkoji Sando (善光寺参道) is a street leading to Zenko-ji Temple. It was built in 1714. There are many gift shops and hotels. These stores are existed since the street was built. Those hotels are called "Syukubo." People who are attending the practice at Zenkoji Temple stay there. The old stones used to pave the approach to the temple have been designated a Nagano City Cultural Treasure. Those stones was given by Otakeya in 1714. It is 393m long stone road. Otakeya was the owner of stone material dealer in Edo. He succeeded in his business but his son was so debauched man, and one day Otake killed the thief at night. However, he found out it was his son. After he killed his own son, he give the store to the other son and traveled around Japan. He finally visited Zenkoji, and found out that the stones of road was so hard for visitors. He offered Zenkoji his stones to built a better road for visitors.